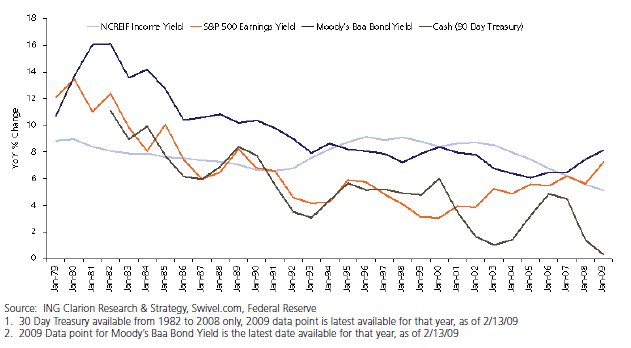 Editor’s Note: For its fifth post, RealForecasts.com is re-publishing a white paper titled “Asset Allocations Through the Recession”, which was written in May of 2009 and distributed by ING Clarion Partners to institutional investors and consultants. Based upon its thoughtful approach and the accuracy of its forecast and recommended strategy, I&P Real Estate selected the article for its compilation of best articles about real estate during The Great Recession. The precipitous decline in the public-equity markets over the past year reduced total portfolio size for many institutional investors. As a result, allocations to the real estate asset class for many investors now account for a larger share of total assets, and allocations are no longer within target ranges. For example, a year ago, many institutional portfolios were at or below real estate targets of 7% to 8%; today, real estate may represent 10% to 11% of portfolios. Investment professionals often refer to this phenomenon as the “denominator effect.” This has led many investors to consider reducing their real estate portfolios in order to bring their real estate allocations back into prescribed ranges. However, ING Clarion believes that investors should consider maintaining real estate allocations through the downturn, even if current allocations are inconsistent with strategic targets. While uncertainty is pervasive today, history reminds us that extreme market cycles in public equities and private real estate have ultimately been temporary, and we believe that the current downturn will likely follow this pattern. ING Clarion expects that public equity and private real estate markets will revert to long-term valuations (albeit, below their market peaks), thereby reversing the denominator effect and bringing actual allocations back in line with strategic targets. During the past 30 years, declines in the S&P 500 Index (the “Index”) have typically been followed by sharp rebounds shortly after the Index reached cyclical troughs (Figure 1). For example, after experiencing significant declines from late-2000 through 2002, the Index had recovered most of its losses by the middle of 2003. Although the magnitude of the current decline has eclipsed that of 2000-2002, history suggests that the monetary policies and fiscal stimulus programs underway today should help lead to economic stabilization and an eventual recovery of the economy and the indices. 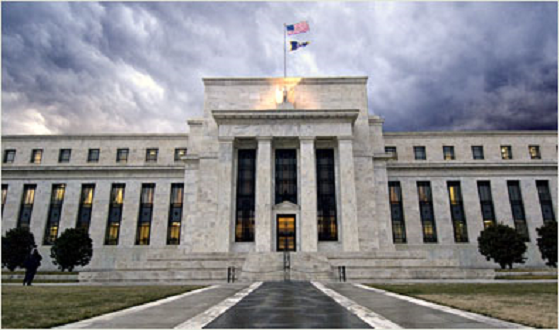 In response to the slowing economy in the second half of 2000, for example, the Federal Reserve aggressively lowered its policy rate from 6.5% in December 2000 to 1.75% in December 2001. Since August 2007, the Federal Reserve has similarly lowered its policy rate from 5.25% to effectively zero today. In addition to lowering its policy rate, the Federal Reserve has been aggressively pushing money into the banking system by purchasing Treasury securities in the open market. Forecasting a market bottom is difficult at best. However, the historical lesson is that in the past, markets have often turned quickly once reaching their nadirs. Therefore, we believe that decisions regarding strategic asset allocations should be made with a mid-to long-term view rather than as a reaction to short-term fluctuations of individual asset classes. For those concerned with long-term economic returns, we believe that the case for maintaining consistent allocation to real estate may actually be stronger. Private real estate generated the highest total returns on a risk-adjusted basis among the major asset classes over the last three decades (Figure 2). Private-market real estate has also generated the second-highest average earnings yield among the four major asset classes over the past 30 years and the highest earnings yield on a risk-adjusted basis (Figure 3). Private real estate has also shown low or negative correlations with equities and bonds, which provides powerful diversification benefits in a mixed-asset portfolio (Figure 5). Note that prior to the current decline, private-market real estate had reported negative returns only once during the past 30 years (Figure 1). Similar to declines in the public equities markets, real estate’s decline was followed by a significant rebound. After posting negative returns from mid-1991 to mid-1993, the NCREIF Property Index recovered most of its losses by the end of 1994. In addition to potentially superior risk-adjusted returns and diversification, we believe that private market real estate can also be viewed as a valuable hedge against the ravages of price inflation. Many economists believe that once the credit markets, equity markets and economic activity recover, the massive monetary pumping and unprecedented fiscal stimulus programs currently underway will re-ignite the flames of inflation. If these forecasts prove correct, we believe that the case for maintaining real estate allocations through the downturn becomes even more compelling. This entry was posted in Economics, Investment Strategy, Market Forecasts, Real Estate on November 5, 2013 by Jeff Peshut.